Sporting a full roster, the Newsome High School Varsity boys and girls lacrosse program was pleased to announce the start of its inaugural season last month. Formerly, Newsome Lacrosse Club, the team is now facing a competitive season loaded with talented opponents, and is ready to measure up its strength against area teams. “This is the first year that the program is recognized as a varsity sport,” said Michelle Greene. Considered as one of the fastest-growing sport in the country, especially within the high school level, it is said that the sport is now strutting an estimated 282,000 high school players. As a varsity sport supported by Hillsborough County, Lacrosse Alliance (HALAX), a 501(c)(3) charitable organization that works with Hillsborough County Public Schools managing the transition of high school lacrosse from a club sport to an FHSAA-sanctioned sport, Newsome High School Lacrosse will take part in the 2014 spring season under a play-to play format to cover the costs associated with the program. For more information visit www.halax.org. Capitalizing on its district championship title and building on the momentum of success, the Newsome High School Boys varsity soccer team finished its post-season-run just one game short of a state appearance. 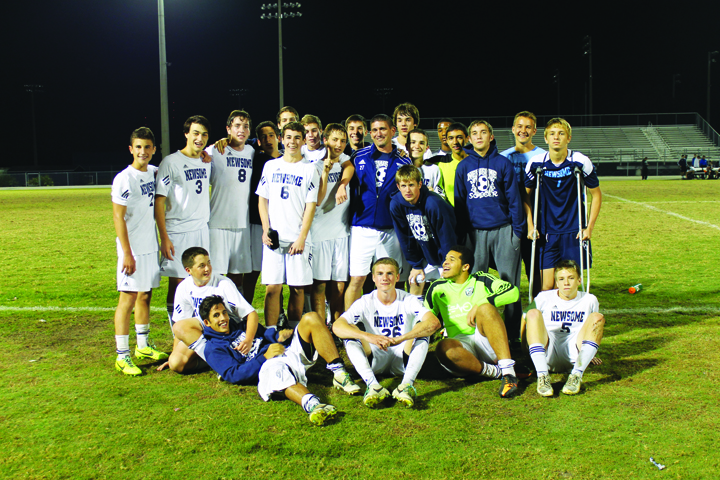 The Wolves had sealed their district title with a 5-1 victory against Durant High School. After defeating Timber Creek and Freedom in the regional quarter and semi finals, the Wolves faced East Lake, but suffered a loss ending the programs chances to take part in the Class 5A State Championship match. In his 20th year of coaching, Wolves head coach Allen Ware, who celebrated his 200th win while playing against his brother Coach Scott Ware of Wharton High School, was pleased with his players for enjoying the season, working hard, wanting to compete and playing each match until the final whistle. For more information about the season visit www.FHSAA.org. Pinecrest Little League is celebrating its 46th anniversary this year. Steeped in history and confident of another season success, league officials invited the public to join them for special season opening ceremony scheduled for Saturday, March 1. The event sported a full list of activities, including a home run derby, bouncy houses, a dunk tank, a 50/50 drawing, just to name of a few of other fun things for everyone to enjoy. Only minutes from FishHawk, located at 9312 S.R. 39 S. in Lithia, the Pinecrest Little League baseball and softball program welcomes the 2014 spring season with six playing fields, lots of parking and plenty of room for players, offering a home to all who love the sport and are willing to wear a PLL uniform.